March 21st and 22nd were long days for Travis and Clayton (pictured left and right below). 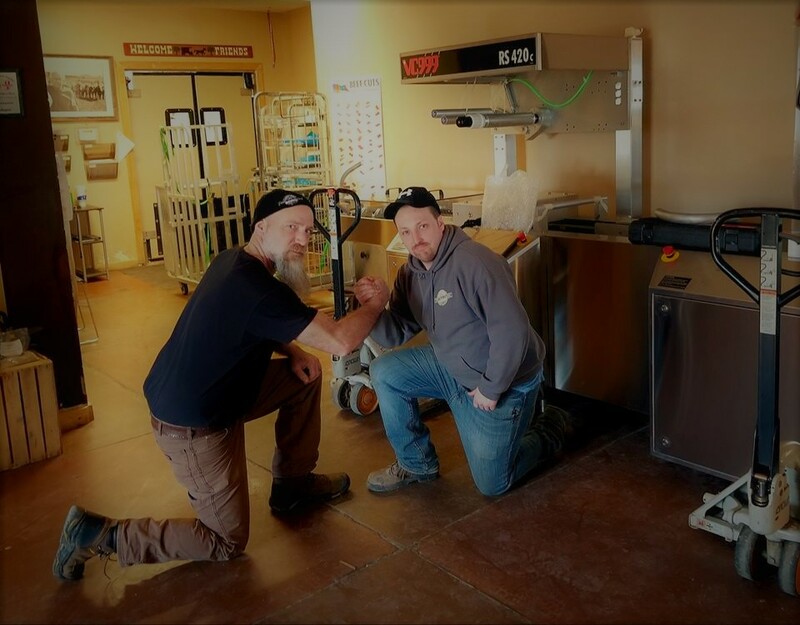 Despite the fact that the machine weighed 5000lbs, came on a semi truck with a bed several feet off the ground, and could not be unloaded with a loading dock (as we don’t have one yet), these two guys were able to get it unloaded and into our facility. It took some rural makeshift ingenuity and a whole lot of sweat, but this machine is now in action on our processing room floor! The VC999 roll stock packaging machine will greatly improve our packaging. Our packages will still be vacuum sealed, but will look much neater now, with less excess plastic and a flat surface for more tidy labeling. We’re still learning the details of using the machine, but expect the new style of packaging to appear within the next few weeks. We’re incredibly happy with this upgrade, and look forward to providing a more professional looking product for all of you. We’re upping our game, so you can up yours! You can check out this new packaging, and give Travis and Clayton some well deserved pats on the back when The Piggy Stays Home at This Old Farm on Saturday May 18th.